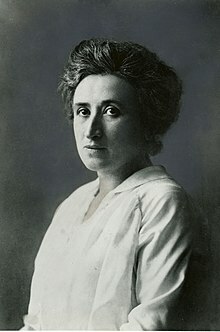 Rosa Luxemburg (an aa Rozalia Luxenburg; Pols: Róża Luksemburg; 5 Mairch 1871 – 15 Januar 1919) wis a Marxist theorist, filosofer, economist, anti-war activist, an revolutionary socialist o Pols-Jewish strynd wha acame a naituralised German ceetizen. She wis, successively, a member o the Social Democracy o the Kinrick o Poland an Lithuanie (SDKPiL), the Social Democratic Pairty o Germany (SPD), the Independent Social Democratic Pairty (USPD), an the Communist Pairty o Germany (KPD). In 1915, efter the SPD supportit German involvement in Warld War I, she an Karl Liebknecht co-foondit the anti-war Spartacus League (Spartakusbund), that eventually becam the KPD. In the November Revolution she co-foondit the newspaper Die Rote Fahne ("The Reid Banner"), the central organ o the Spartacist muivement. She conseedert the Spartacist uprisin o Januar 1919 a blunder, but supportit it as events unfauldit. Friedrich Ebert's majority Social Democratic govrenment crushed the revolt an the Spartakusbund bi sendin in the Freikorps (govrenment-sponsored paramilitar groups consistin maistly o Warld War I veterans). Freikorps truips capturt an summarily executit Luxemburg an Liebknecht in the rebellion. Luxemburg's bouk wis thrawn in the Landwehr Canaul in Berlin. Due tae her pyntit creeticism o baith the Leninist an the mair moderate social democratic schuils o socialism, Luxemburg haes haed a somewhit ambivalent reception amang scholarts an theorists o the poleetical left. Nanetheless, Luxemburg an Liebknecht war extensively idolised as communist mairtyrs bi the East German communist regime. The German Federal Office for the Pertection o the Constitution notes that idolisation o Rosa Luxemburg ad Karl Liebknecht is an important tradeetion o German faur-left activism. ↑ Leszek Kołakowski (, 2008), Main Currents of Marxism, Vol. 2: The Golden Age, W. W. Norton & Company, Ch III: "Rosa Luxemburg and the Revolutionary Left"
↑ 4.0 4.1 Gedenken an Rosa Luxemburg und Karl Liebknecht – ein Traditionselement des deutschen Linksextremismus (PDF). BfV-Themenreihe. Cologne: Federal Office for the Protection of the Constitution. 2008. Archived frae the oreeginal (PDF) on 13 December 2017. This page wis last eeditit on 10 September 2018, at 06:20.